Whether you’re a PRCA pro or just swinging your first rope, the BONES heading dummy from Heel-O-Matic provides full curl practice sessions that will improve your accuracy, sharpen your skills, and give novice ropers a controlled practice experience to build rope handling skills. Made of durable, molded plastic, the BONES’ dimensions were carefully chosen to create the most realistic heading dummy on the market. The sturdy, wide base ensures that Bones won’t tip, slip or slide, even after years of practice. 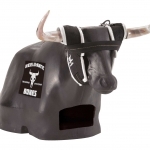 Each BONES comes with a real horn wrap and sets of short (19”), medium (28”) and long horns (33”) to provide you with variable practice challenges or to customize your BONES to resemble the live cattle in your area. 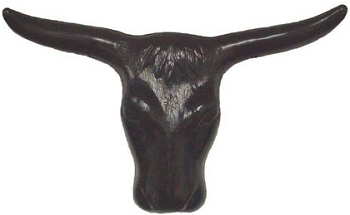 Leave the horns off completely to provide a 14” spread for calf and breakaway ropers. The built-in handle and 45 pound total weight make the BONES easy for anyone in the family to transport. 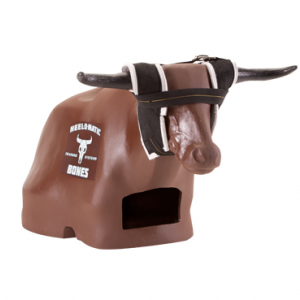 Add challenge to your practice session by raising, lowering or tipping the BONES head with our unique base inserts. BONES provides practice opportunities in nearly any environment and any weather condition. Take your roping practice inside if Mother Nature doesn’t cooperate. Throw it in the truck or trailer for practice and entertainment at all of your equestrian events. You’ll also love the hours of enjoyment that BONES provides to younger ropers. Weight: 45 pounds Length 47" Width 23" Height 25"
This item ships ground. If you need 2nd day or three day please call for pricing. Item not available for discounts. Price is for online only. Q: is this for kids, what are the dimensions of The Bones Roping Dummy? A: The Bones can be used at any age. 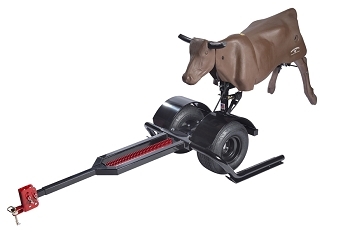 However, if it is for a small child there is the leapsteer which is much smaller. The Bones is 47"x23"x25" and the leapsteer is 17" tall.